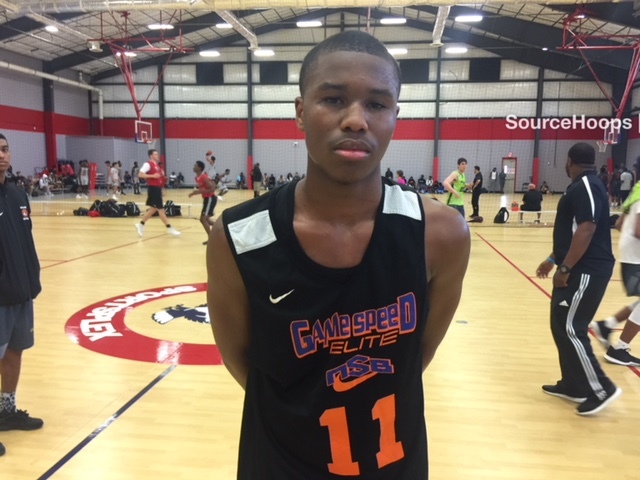 There was no shortage of talent at the 2018 Breast Cancer Awareness Classic held this past Saturday at Oakridge High School in Orlando. Now a senior, we’ve been tracking the progress of 6’6 Jalen White since his first days as a high schooler. His performance on Saturday was by far the best we’ve seen from him. With a strong frame and broad shoulders, White wisely bypassed shots from the perimeter and made a concerted and consistent effort to get into the lane and score around the basket, powering thru traffic to score with either hand. White was one for two from beyond the arc but we were more pleased with his six of seven performance from the free throw line. His shot mechanics and the consistency of those mechanics are greatly improved. White is a solid threat to grab rebounds off the defensive glass and push the ball up the floor on his own. When we took in the SIAA Krossover event three weeks ago, 6’2 junior point guard Luis Rolon unable to play due to an ankle injury. On Saturday, he was back in action and made a significant difference for Kissimmee Central Pointe. With crafty ball skills and excellent court vision, Rolon is quick to break down the defense, diagnose where the ball needs to go and get it there quickly. At times, his play can be considered “high risk/high reward” but he is effective more often than not. While maybe not the quickest on-ball defender, Rolon is alert for tips, deflections, and steals when the ball comes into his area. The one knock on him at this point is his perimeter shooting, something that should correct itself with repetition over time. Isaiah Elmore, a 6’7 junior, was very solid in his play for Tampa Catholic. He drained a pair of long jumpers in the early part of the contest and later took his defender off the bounce from the wing to score at the rim. Elmore is not yet a full-time perimeter player at either end of the court, but his progression is encouraging. Also encouraging was his willingness and ability to chase down opponents from behind to block what appear to be easy, uncontested layups. Elmore did that at least twice in Saturday’s contest. While arguably not a great run/jump athlete, Elmore is still a more-than-capable rim protector and shot challenger to opponents trying to score in the lane. Arguably the top performance of the day came from 6’6 senior Kenan Blackshear (pictured above) of Orlando Jones. He (and the team) got off to a slow start against West Oaks, but he scored all of the Tigers eight first quarter points in the final 1:37 of the period to give an indication of what was to come. Blackshear has always been a skilled player with the ability to play multiple positions and doing whatever needs to be done for his team to win. This season, Jones needs him to score and he did so in a variety of ways. Blackshear was 3-4 from beyond the arc, converted a pair of three point plays, and had a couple of steal-and-score baskets on his way to 29 points. Not only has his shot improved but so has his ability to put the ball on the floor and score thru traffic with contact. Defensively he has the ability to defend multiple positions along the perimeter. We’ve always felt that Kaleb Coleman, a 6’7 senior at Oakridge, was under-valued. We first noticed him as an eighth grader that had solid scoring tools down low. Fast forward to today and Coleman has become a reliable “3-and-D” type of player. He has developed an excellent shot from the perimeter and can still take a mismatch down low and score inside. Coleman uses his outside shooting to set up drives to the rim and is usually successful, either scoring or drawing a trip to the foul line. He controls his rebounding area on the defensive end and pursues offensive rebounds and 50/50 balls with great effort. Coleman will be a key factor in the Pioneers’ run to another Class 9A state title.